Rabbi of Jerusalem, later of Safed; flourished at the end of the seventeenth and the beginning of the eighteenth century. He was the colleague of Abraham Yiẓḥaḳi (comp. Grätz, "Gesch." x. 517, note 6) and the son-in-law of Jacob Ḥagiz. In 1701 he signed at Jerusalem a circular letter in favor of Moses Ḥagiz, addressed to the community of Leghorn (see Moses Ḥagiz's "Sheber Poshe'im," No. 11). From the same work (No. 1) it is known that the full name of his father, who was a member of the rabbinical college about 1693, and author of cabalistic works, was Obadiah Aaron Ḥayyon. 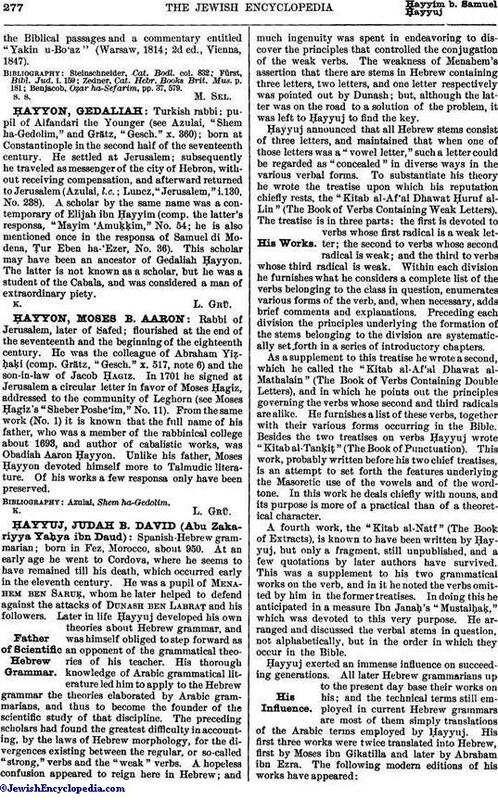 Unlike his father, Moses Ḥayyon devoted himself more to Talmudic literature. Of his works a few responsa only have been preserved.